To register for Story Times, please visit the Events Calendar. Plumb Library Storytimes are a fun mix of interactive book read-alouds, finger plays, action rhymes, puppets, music, games, crafts, and snack, if approved by caregivers. Storytimes are offered first to Rochester children ages 9 months – 5 years old: Preschoolers (ages 3-5); Toddlers (ages 2-3); and PreToddlers (ages 9-24 months). If space is available, children from other towns are welcome. 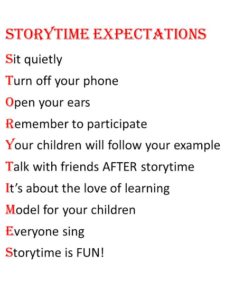 Storytime utilizes the “Every Child Ready to Read” program which focuses on the 5 skills that children will need to help them learn to read: Singing, Talking, Reading, Playing, and Writing. 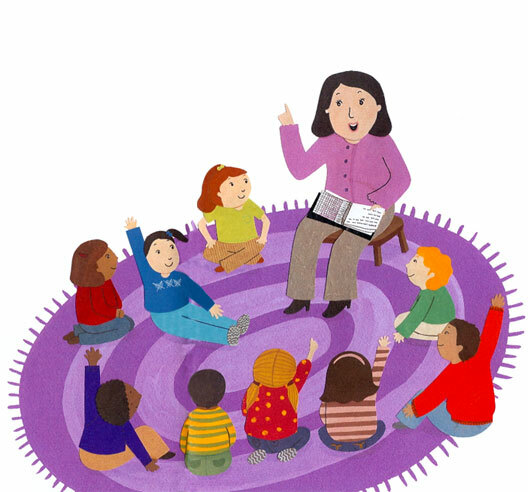 Storytime sessions are once per week for 6-7 weeks during the fall, winter, and spring. Registration is held the first weeks of September, December, and February. Summer Storytime is based upon interest and would begin shortly after the school year ends. Online registration on the Events Calendar is REQUIRED for these programs. Storytimes are free thanks to the support of the Friends of Plumb Library. Consider joining the Friends to support this and other Plumb Library programs. Preschool Power Story Time, for ages 3-5: Wednesdays, 10:30 am to 11:30 am and Thursdays, 1:30 – 2:30 p.m.
Preschool Power is a program for children ages 3-5 years old. Caregivers must participate only as needed. Children are encouraged to independently participate. Families must contact the library by PHONE (508-763-8600) if they cannot attend a session. Twos and Threes Together, for Twos and Threes, Fridays, 10:30 am to 11:30 am. Twos and Threes Together is a partial lap-sit program for toddlers ages 2-3 years old. Caregivers must participate with their child. Families must contact the library by PHONE if they cannot attend a session. 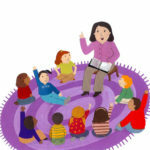 Baby and Toddler Tales is a lap-sit program for children ages 9-24 months. Caregivers must participate with their child. Families must contact the library by PHONE if they cannot attend a session. Visit the library with your child before the first storytime session. Knowing what to expect helps everyone feel comfortable. Session placement is based on birth dates. We are always flexible to discuss your child’s placement to ensure the best developmental fit, but we cannot accommodate scheduling conflicts. Promptness and attendance is important! By registering your child, you are agreeing to commit to attendance at a multi-week program. PLEASE call us at 508-763-8600 ASAP if you can’t attend a session, if you are running late, or if you need to drop out of a session. DO NOT EMAIL! Emails do not get read in time. Storytime follows the RMS school schedule. Storytime will not be held if RMS is closed unless otherwise noted. Call us when RMS has a snow day. The library might still be open. When in doubt, call us or check the library’s website or Facebook page for closures. Online registration on the Plumb Library Event Calendar is required for every session. These are not “drop-in” programs. Registration information required: Caregiver and child names, phone number(s), email(s), residency, child’s date of birth. Rochester residents are given first preference for a storytime spot. Non-residents will be placed on a waiting list, and called ASAP if space is available. There are a limited number of openings per session. Storytime space, crafts, and snacks are prepared for the number of children registered only. We’ll gladly provide unregistered guests or siblings with coloring sheets, but they cannot participate in the storytime session unless there is an absent storytimer. Help us reinforce appropriate library and social behavior! For many children, storytime will be their first peer group experience, so we will model positive, kind interactions with peers and adults: walking feet, inside voices, listening ears, sharing with friends, and gentle treatment of library items. Please step in when necessary to help your child cooperate. If your child becomes uncooperative or restless, please quietly leave out group to relax and refocus. Rejoin the group when your child is ready. Keep in mind that you set the example for your child. 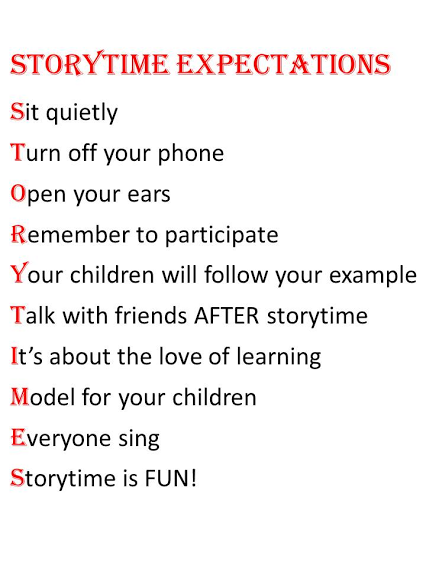 If you don’t listen quietly while stories are read, the children will not site quietly either. There is ample time to socialize as soon as storytime is over. Quiet indoor play time is encouraged after storytime Playtime must be monitored by caregivers. We will provide various play items, but all families are responsible for clean-up! The program doesn’t end when you go home! Talk about storytime activities, sing the songs, and read books at bedtime, quiet time, or anytime!